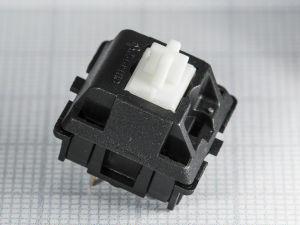 Cherry MX is one of the most common mechanical switches on the market; certainly so for contemporary mechanical keyboards produced by the likes of Ducky, Filco, Leopold, PLU, HPE, KeyCool and others. 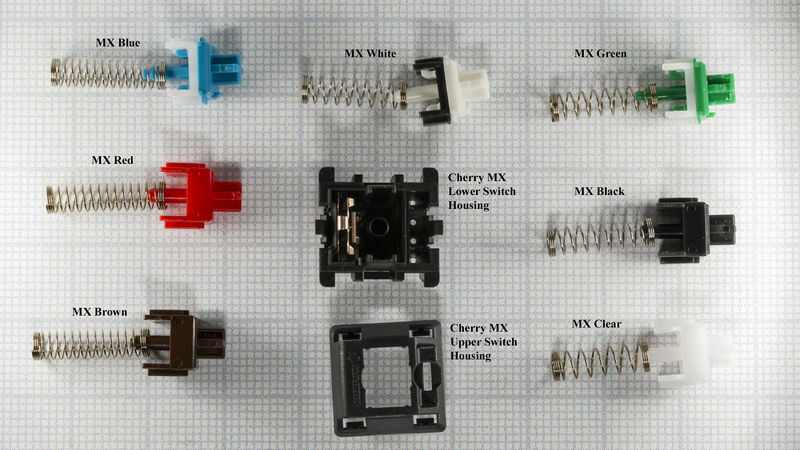 Cherry MX switches are operated by depressing a spring-loaded slider to or past the actuation point of the switch. The slider is either a linear or tactile 'ramp' that displaces a leaf spring. When the slider is depressed, the leaf spring is allowed to complete the circuit between the + and - terminals that are soldered to the PCB. Cherry MX switches are commonly referred to by their slider color but each switch also has it's own model number. Most parts suppliers will only accept the part number, so don't expect to find 'Cherry MX Browns' listed as such on Mouser. There are four 'common' MX models in addition to a few other switches that are not often used by keyboard OEMs. These are switches that are not commonly used by OEMs anymore. Some people prefer these less common switches due to their specific feel or actuation force. Clear Pronounced Tactile (moreso than MX Brown), slightly heavier spring than MX Black. Green Tactile & Clicky, medium-heavy spring. Commonly used in spacebars on MX Blue boards. Light Grey Pronounced Tactile, heavy spring. Commonly used in spacebars on MX Clear boards. White Tactile & Clicky, very heavy spring. These are similar to MX Blue, but require almost double the actuation force. Note that the light Grey and dark Grey are very close in color. These are switches that have been modified using parts from different Cherry switches. Since the switches are easily modified, many users have exchanged stems and springs to create unique switches. Ergo- Clear Combines the stem from a Cherry MX Clear with the spring from Red/Brown/Blue. Creates a lighter, crisp and pronounced tactile point than MX Clear. Some people report rebound issues but the spring from MX Blue/Brown/Red is generally strong enough to return the switch to the Off position. Ghetto Green / Bruise Combines the stem from a Cherry MX Blue with the spring from MX Black. Approximates the feel of a Cherry MX green and can be assembled from more commonly-available switch components. Ghetto Reds/Blacks Swapping springs between MX Red and Black. 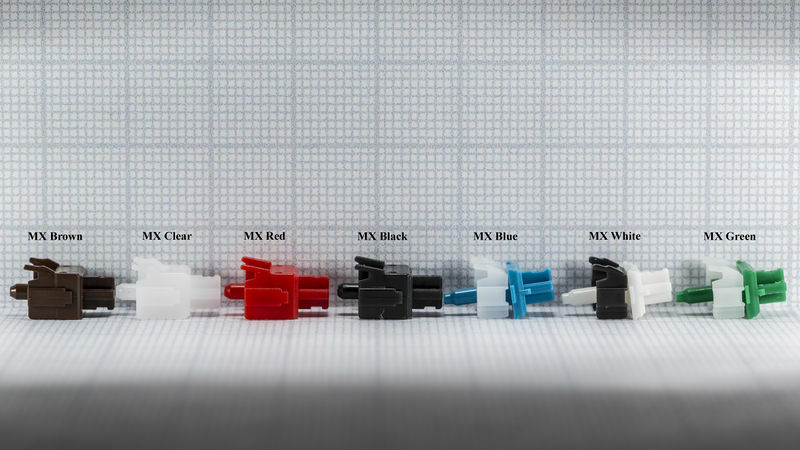 MX Red and Black stems are identical except for color, so if you want to try one or the other all you need to do is replace the spring. Panda Clear Combines the stem from a Cherry MX Clear with the spring from MX Black. Creates a slightly lighter, crisp and pronounced tactile point than MX Clear. The difference between MX Clear and Panda Clear is less noticeable than the difference between MX Clear and Ergo Clear. Supergo Clear (working name) Korean 55g spring combined with MX Clear slider. Very light with lots of tactile feedback. Due to production tolerances, not all 55g springs are capable of pushing the clear stem back into place post-actuation, so a modder should order enough springs to replace ineffective ones during this mod. Baby Blues (working name) Korean 55g spring combined with MX Blue slider. Very light with a little tactile and a soft click. The Jesus / The White Light (working name) MX White slider (the white) combined with Korean 55g spring (the light). Similar to Baby Blues with a softer audible click. Tacto-blacks MX Brown slider combined with MX black springs. More or less the same actuation force as MX Black with a small tactile bump. They're slightly more resistant but MX browns are known for their very slight tactile bump so it doesn't add too much. This page was last edited on 5 July 2013, at 19:12.